Australia is home to at least 200 Melaleuca species. This is a rather plastic figure as there are some yet to be named whilst there are others yet to be discovered. Western Australia has the lion’s share with a high concentration occurring in the southwest corner. Unfortunately, few species are in general cultivation. Many Western Australian species have great horticultural potential. We are successfully growing a number of Western species in our high-altitude garden west of Armidale, New South Wales. One species from the west is of particular interest. This is a shrub reaching a height of 1.5 metres. 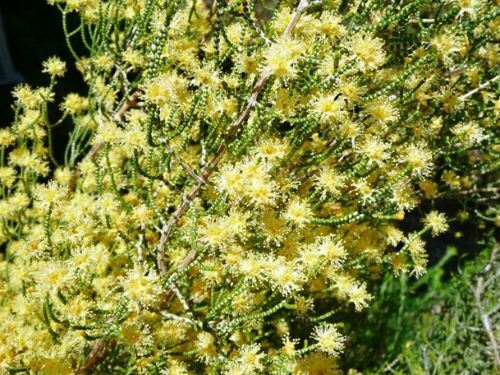 When plants are not in flower, this Melaleuca resembles a miniature conifer and when blooming, with its small, yellow, globular flower heads, bears a resemblance to a small wattle. Melaleuca micromera has minute, scale-like leaves held in whorls of three. The flower heads are bright yellow with 4 to 8 flowers per head. Flower clusters are carried laterally and terminally. The terminal flowers are male. Spring is the flowering period and plants are a mass of colour. We propagate this Melaleuca from cuttings and they produce roots quickly and enthusiastically. The type specimen was collected by Johann August Ludwig Preiss in 1840 about 100 km northeast of Albany and just south of Tinkelelup Nature Reserve.